Our ever-growing range of stencil designs are perfect for DIY Décor! Stencils offer so many creative opportunities: they work great not just for wooden and ceramic blanks but for walls; floors; ceilings; fabric and furniture! Lamp Shades, accent pillows, rugs and even hand-made paper cards – all of these DIY projects are Stencil-worthy! Getting started: NB: Work out your technique and colour combo on a sample first. It’s always a good idea to make a sample first! Make sure you like your colour combinations and are comfortable with your stenciling technique before hitting the real wall, piece of furniture or floor! Position your stencil where you like it. You can tape it down with masking tape, we prefer to use a spray adhesive to achieve even cleaner edges. Make sure you shake the can well and lightly mist (not drench) the back of the stencil, and let it dry for a moment before positioning it on the wall. This step will prevent the adhesive residue transferring to your surface. You’ll need to re-mist the stencil after a few repeats. 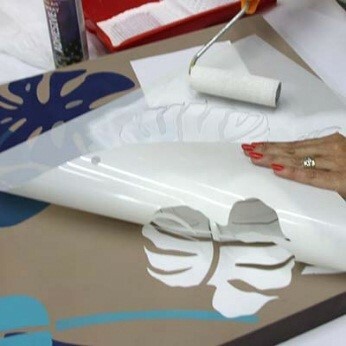 Stenciling with a Roller: This method is good for large stencils. Use only dense foam rollers with rounded edges. Regular fluffy rollers won’t work, they hold too much paint! Load your dry roller by rolling it over the paint a few times until it absorbs most or all of it. Blot off the excess paint on the paint tray and then roll the roller back and forth a couple of times on paper towel or newspaper. It’s better to have less paint on your roller than too much paint. About Paint: Any water-based paint should work. Craft acrylics are great and the best in our opinion is our own range. It has just the right consistency for stenciling. Ok! Now you are ready to stencil! Roll the stencil with your roller using light to medium pressure. Excessive pressure may cause paint bleeding under the stencil. Also, be careful not to roll over the outside edges of the stencil. We design most of our stencils with at least a 0,5-1cm frame to give you some rolling room, strategically placing paper or masking tape on the narrowest edges can help prevent “roll-overs”. When stenciling lighter colours over darker colours, you may need 2 or more coats to achieve good coverage. Let the 1st coat dry before rolling the stencil again. Now remove the stencil and enjoy your artwork! A note for the impatient: Don’t just yank the stencil off your surface! It’s always a good idea to remove it somewhat slowly so that the tape/adhesive spray doesn’t accidentally pull off any background paint. If you are doing repeat stenciling, there is no need to clean the stencil in between. It’s time to clean the stencil when your paint build-up starts to compromise the design. If you would like to do your next repeat in a different colour, make sure that the previous colour has completely dried on the stencil so it will not transfer to your next print. It’s a good idea to clean the stencil if you want to flip it over to create a mirror image. We recommend a separate foam roller for each colour, as the roller must be dry to begin with. Stenciling with a Stencil Brush: You can also use a stencil brush to stencil your design although it is much faster with a roller. 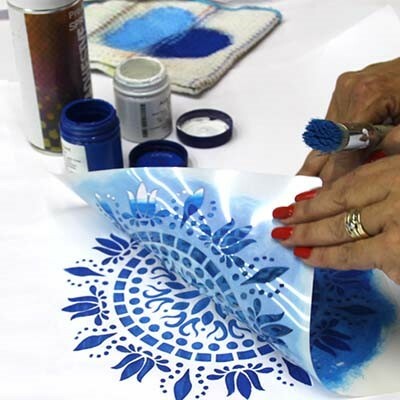 For smaller, more intricate designs, multi-coloured and shaded designs and with Underglaze paint, it’s better to use a stencil brush. You’ll need to dedicate a separate brush for each colour. Load your brush with paint rather than just dipping the tip of your brush in the paint. Distribute the paint on the brush tip by doing a few circles on a scrap paper or newspaper. Now lightly rub off some paint onto a rag and you are ready to stencil. Your brush should have very little paint on it! Remember, less paint is better for stenciling! It’s best to use a light circular motion with your brush. Just dab and swirl in a light sweeping circular motion, covering all of the design. About seepage and imperfections: Even with a proper loaded roller and correct technique you might get some minor seepage here and there. In most cases it’s not noticeable, especially from a couple of feet away and it can be easily touched up with a small brush. Don’t forget that you’re creating a “hand-painted finish”. A few imperfections and some paint seepage here and there are natural and inevitable for this type of work. To avoid seepage, use spray adhesive and less paint on your roller and brush. About Connectors: Connectors (also referred to as “bridges”) are the small sections of the stencil pattern that hold the stencil together. Some people prefer to paint over the gaps left by the connectors when the stenciling is complete. Doing this can sometimes improve the look but is not always necessary. In general, we try to design our stencils in such a way that the connector blends with the flow of the organic design and are not too obvious, or in a way that they contribute to the pattern. Cleaning and Storage: The stencil will eventually accumulate a thick layer of paint after many repeats, so it will have to be cleaned. Give it a brief soaking in a tray or tub of water and then wash off the paint. Best cleaning method we have found is to place the stencil on a flat surface and scrub it with a dish cleaning sponge under running water. The paint comes right off and the stencil doesn’t get entangled or damaged this way. If you accidentally break one of the connectors in the design while stenciling or cleaning, you can easily fix it by attaching small pieces of clear packing tape on both sides of the break. After the stencil is clean, place it on a towel to dry and pat it with the towel to speed up the drying process. For a large project it may be smart to purchase 2 or 3 stencils to save time on cleaning. Store your stencils flat, in large drawers if you have them, or under the bed interlaced with paper. Alternatively, you can hang them clipped to a clothes hanger, but don’t store them rolled.